The former Finance Minister and the Coordinating Minister for the Economy, Dr Ngozi Okonjo-Iweala has released a memo in respect of the arms deal saga. Report have it that the ex-minister approved the request for the transfer of $300 million and £5.5 million of the recovered Abacha funds to ex-NSA Sambo Dasuki despite knowing that request was outside the scope of the law. "Compliments. For the past week, Edo State Governor, Adams Oshiomhole and other compromised persons and media have embarked on a campaign of falsehood against Dr Okonjo-Iweala. They have distorted the contents of the January 20 memo in which she responded to a request by the former National Security Adviser and quoted selectively from the document to make their false allegations of “illegal diversion” of funds. For your information and a fuller understanding of the issues, please see the January 20 memo by Dr Okonjo-Iweala as published. 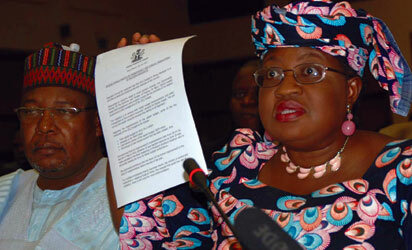 It confirms that Dr Okonjo-Iweala is a transparent person of integrity and patriotic professional who worked hard to protect the interest of the country and that her accusers are purveyors of falsehood on a political mission to tarnish an innocent patriot." “Please find a request by the National Security Adviser (NSA) for the transfer of $300 million and £5.5 million of the recovered Abacha funds to an ONSA [Office of the National Security Adviser] operations account,” the letter read. “The NSA has explained that this is to enable the purchase of ammunition, security, and other intelligence equipment for the security agencies in order to enable them fully confront the ongoing Boko Haram threat.